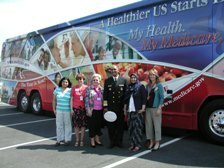 The Medicare/Prevention Bus Tour has already visited a number of states to participate in community fairs, meetings with partnering organizations and senior centers to encourage eligible seniors to sign up for Medicare Part D benefits. 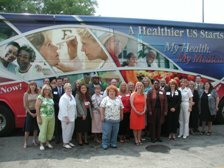 The President's Council on Physical Fitness and Sports celebrated National Physical Fitness and Sports Month on May 3, 2007 by participating in the launch of the Prevention Bus Tour. Luminaries Jack LaLanne, Dr. Ken Cooper, and Bud Seretean were honored as PCPFS Lifetime Achievement Award winners. 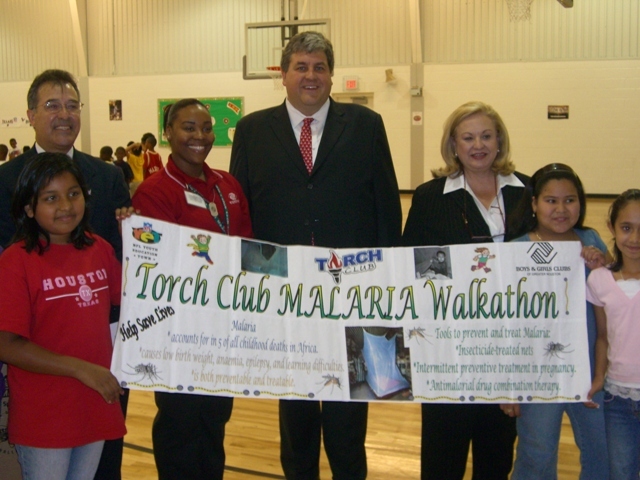 HHS Acting Deputy Secretary Eric Hargan takes the HHS "A Healthier US Starts Here" Prevention Tour to thank the Greater Houston Boys and Girls Club for their work to help care for people with malaria. 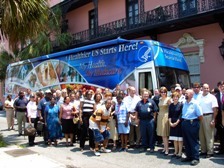 Deputy Assistant Secretary Garth Graham, Regional Director Chris Downing and CMS Regional Administrator Roger Perez met with Mayor Joe Riley and Charleston, SC city employees to recognize the city for its variety of effective wellness programs. 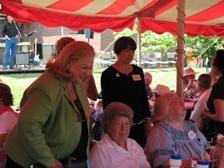 Older Americans Month Celebration. 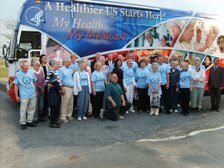 The Healthier US Tour started here on May 24 at the Manassas Senior Center. HHS Assistant Secretary for Aging, Josefina G. Carbonell met with seniors at the Manassas Senior Center in Prince William County, Virginia at their Older Americans Month celebration. Assistant Secretary for Aging, Josefina G. Carbonell met with Medicare partners at the Manassas Senior Center during the bus tour on May 24. Dr. Charlotte Yeh, CMS Regional Administrator, met with Senior Olympians during a stop in Quincy, Massachusetts on May 15. Assistant Secretary for Aging, Josafina G. Carbonell, was entertained by representatives from the Salvation Army New York Chinatown Corps and Community Service Center during the Prevention tour in Queens, New York on May 9. Assistant Secretary Carbonell also met the New Jersey Nets senior dance team during her visit to the New York City Older Americans Month event on May 9. 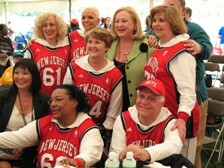 The dance team is comprised of men and women at least 60 years of age who perform during at least six games a season. The dancers receive overwhelming support by Nets crowds and epitomize the Older Americans Month Theme: Making Choices for a Healthier Future. 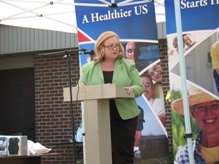 West Virginians have some of the highest hurdles to overcome in the nation: 28.5 percent of the population reports no leisure physical activities, 80 percent report less than 5 servings of fruits and vegetables per day, over 30 percent are obese, WV ranks second highest in the U.S. in diabetes incidence, 25 percent of residents smoke cigarettes and WV leads the nation in the use of smokeless tobacco. Still, the dedicated participants at our recent meeting are determined to make a dent in these statistics and raise awareness about the prevention screenings now available to Medicare recipients. The SHIPs voiced strong support for the Governor’s Healthy Lifestyle Initiative and WV’s First Lady Gayle Manchin works hard to create collaboration between public and private efforts. 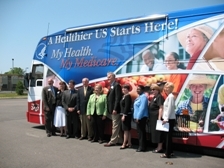 West Virginia was a very positive stop for the Medicare Prevention bus tour! 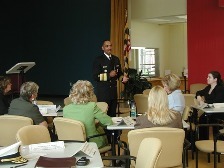 U.S. Department of Health & Human Services Assistant Secretary of Health, Admiral John Agwunobi, speaks with partnering organizations at the Annapolis Senior Center in Annapolis, Maryland. 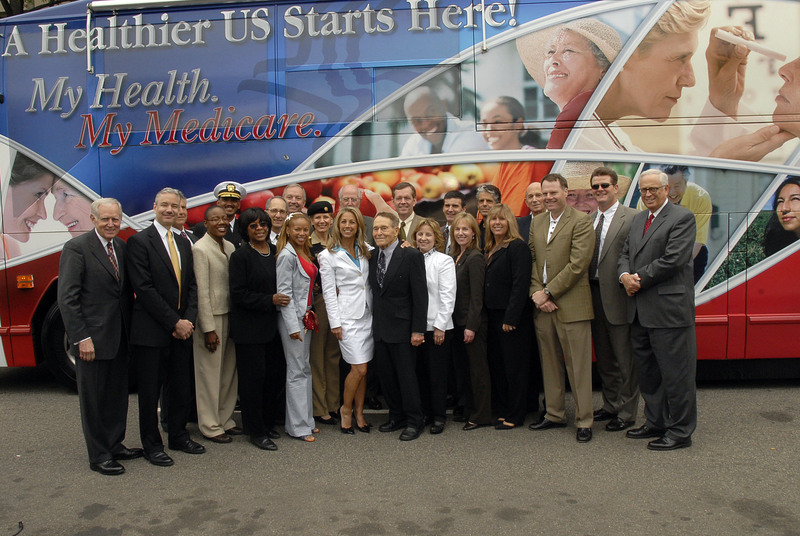 Members of the partnering organizations in Annapolis, Maryland, join U.S. Department of Health & Human Services Assistant Secretary of Health, Admiral John Agwunobi next to the Medicare bus. HHS officials who focus on Indian health care met with representatives of several tribal organizations at the National Museum of Native American History. The bus tour will include several stops at Indian reservations. 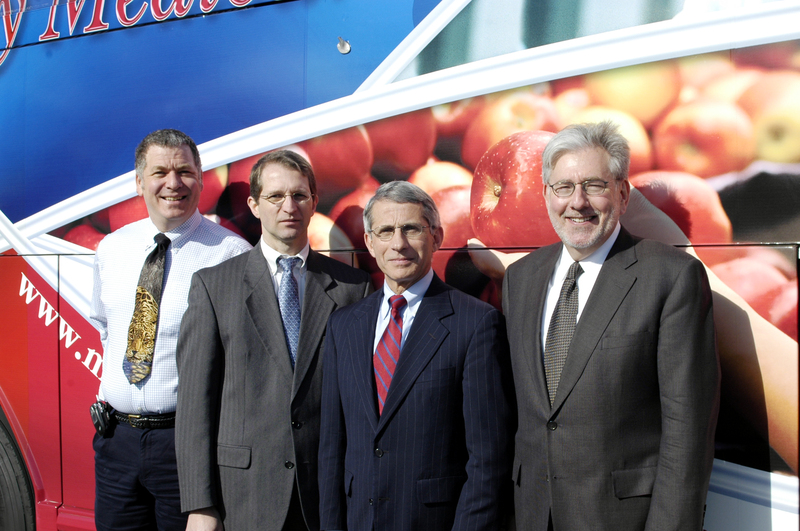 At National Institutes of Health headquarters in Bethesda, Maryland are: (L to R) Jeremy M. Berg, Ph.D., Director of the National Institute of General Medical Sciences; John J. Bartrum, Associate Director of NIH's budget office; Dr. Anthony S. Fauci, Director of the National Institute of Allergy and Infectious Diseases; and Dr. Alan M. Krensky, NIH Deputy Director of the Office of Portfolio Analysis and Strategic Initiatives.